There are currently a growing number of voices calling out for the inclusion of peace education as a compulsory course within the curriculum of schools and other educational institutions. At the Peace Education Development Forum for Global Advancement, which was held under the theme of ‘Looking into a Future of Peace through Peace Education’, ministers of education and senior education officials stated the urgent need of the creation of an environment for the feasibility of peace education and presented the specific roles of the state, government, and schools for its further development. The Peace Education Project, which is one of the core initiatives of HWPL, was initially proposed as a groundbreaking way to achieve the realization of Article 10, “Spreading a Culture of Peace”, of the Declaration of Peace and Cessation of War (DPCW). Education can truly play a leading role in the spreading of a culture of peace, but this can only occur when it properly recognizes and fosters the values and spirit of peace. The core values of peace pursued by HWPL include the “Sanctity of Life”, “Loyalty and Filial Piety” and “Coexistence and Sustainability” and are applied within the broader community in order to resolve various conflicts. Throughout the past year, following the announcement and development of the peace curriculum, materials and textbook, HWPL has been working to develop pilot education programs and initiatives based on the core values of peace in order to foster children, youth and adolescents as global peace citizens. As a result, 164 schools in 12 countries have signed MOUs with HWPL. In particular an MOU was signed with the Commission on Higher Education of the Philippines in January of this year, thus laying the groundwork for spreading HWPL’s peace education to universities all across the Philippines. 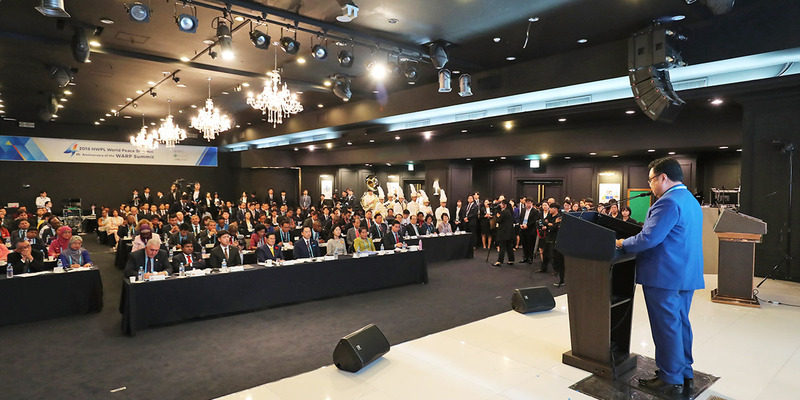 The contents of the MOA included an agreement that the Ministries of Education in those four countries would actively develop policies and programs regarding peace education and would encourage all educational institutions in the country to integrate HWPL peace education into the current curriculums or develop new courses centered around these peace values. 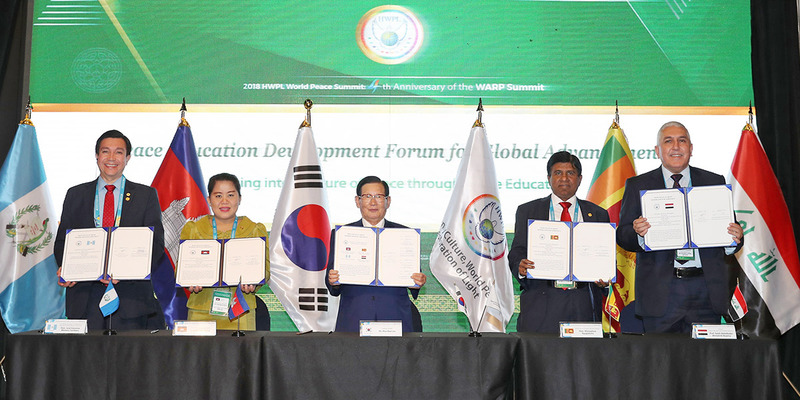 What was agreed on through the MOU was that HWPL is to provide education materials for the operation of the peace education programs and that school principals should provide basic infrastructure for its operation and designate teachers to be in charge of providing the peace education, holding all authority and responsibility and overseeing the entire process. H.E. 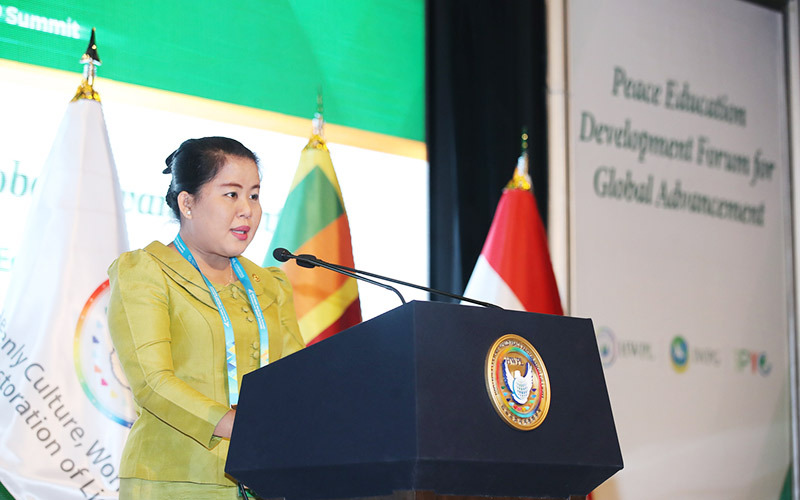 Rachana Khun, Under Secretary of State of Ministry of Education of Youth and Sport of the Kingdom of Cambodia addressed, “After signing MOA with HWPL today, the Ministry will expand its implementation of peace education in educational institutions nationwide more broadly. 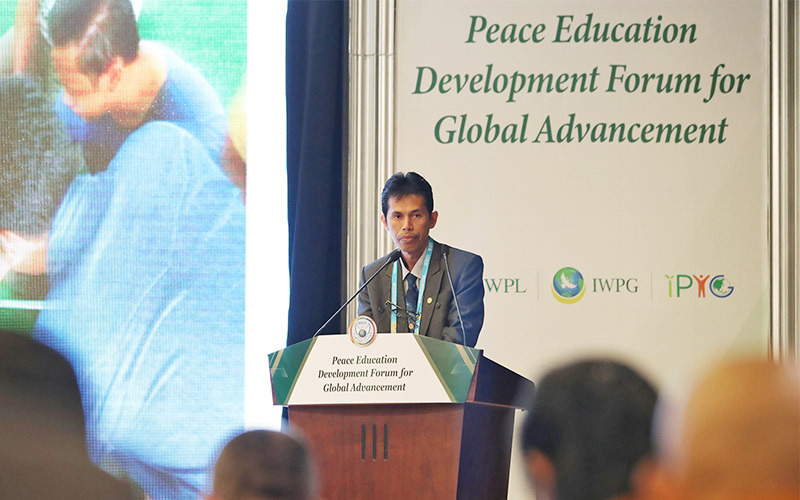 Particularly, the Ministry would like to request HWPL’s assistance in the writing of books on peace education, its teaching methodology, the training of peace educators, and activities to spread a culture of peace in education sector in Cambodia. There was also a presentation of successful cases from teachers and education experts who were first in recognizing the excellence of HWPL’s peace education and have been at the forefront in implementing peace education for children and the youth. 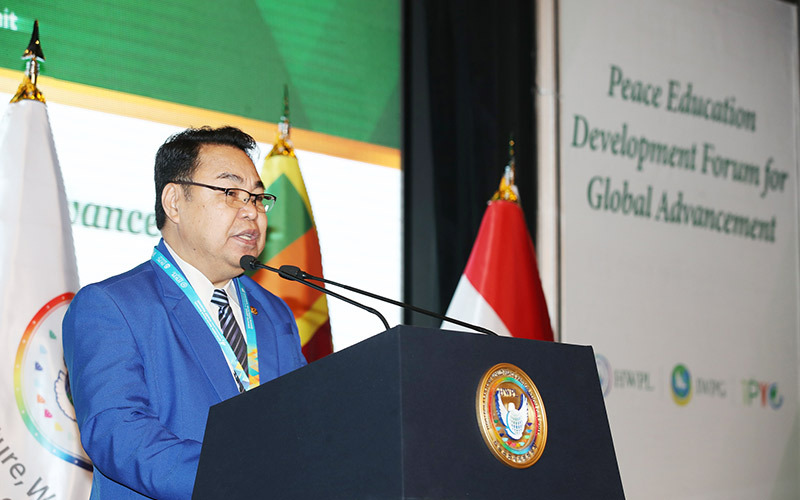 Prof., Dr. Barsihannor Zuhri, Dean of Universitas Islam Negeri Alauddin Makassar, Republic of Indonesia, who had come to Korea to participate in the HWPL peace education workshop along with 10 professors last May stated, “The success of peace education is not indicated by numbers, but rather refers to the competence of students in responding to the difficulties of life.” He then added, “Based on my observation while doing these peace education works and [having] some interviews conducted, students are enlightened about the necessity of peace after being introduced to the curriculum and material of peace values promoted by HWPL. 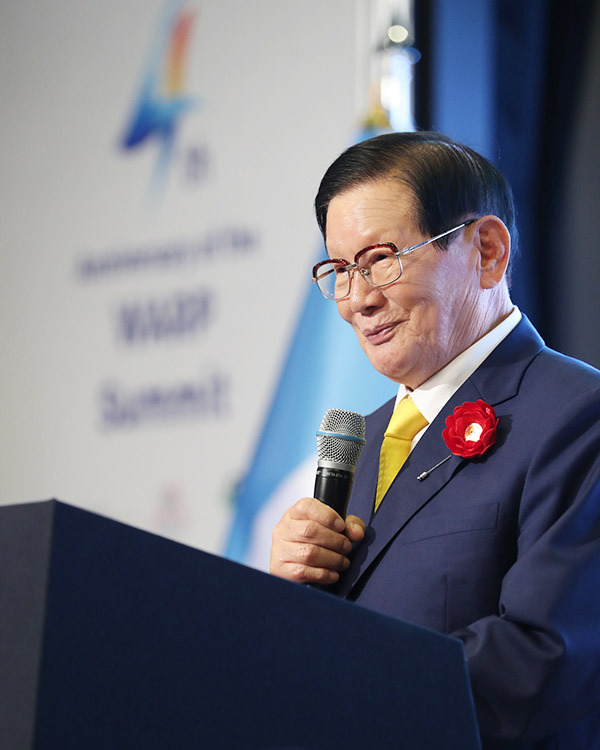 They are committed to spreading the HWPL peace values in society and are concerned with promoting a culture of peace to get prosperity in the future. They consider that peace education is the strategic media for young people, especially children and students in order for them to live with the full meaning of peace culture in their own lives,” furthering his point to present a positive case of conducting HWPL’s peace education. Dr. Ronald Adamat, Commissioner of the Commission on Higher Education of the Philippines, proudly stated, “Today, I am happy and proud to tell you about the good news, that through my initiative, and in compliance with the intent of the MOA with HWPL, the Philippine Commission on Higher Education has approved to integrate Peace Studies/Peace Education into the subjects under the tertiary education curriculum and it shall be implemented amongst State Universities and Colleges, Local Universities and Colleges and private higher educational institutions across the Philippines. It can also come as a stand-alone elective subject.” He emphasized that the students will be equipped with knowledge, skills, attitudes, and values in conflict resolution and peace work and will be further encouraged to work for the cessation of war, hostilities and disunity. The Commission on Higher Education of the Philippines, a governmental organization that supervises and manages university institutions all across the Philippines, has been actively promoting peace education in the country since the signing of an MOA on January 23rd this year, setting the scope of work and responsibilities towards a collaborative peace advocacy initiative that would further strengthen the culture of peace through education. 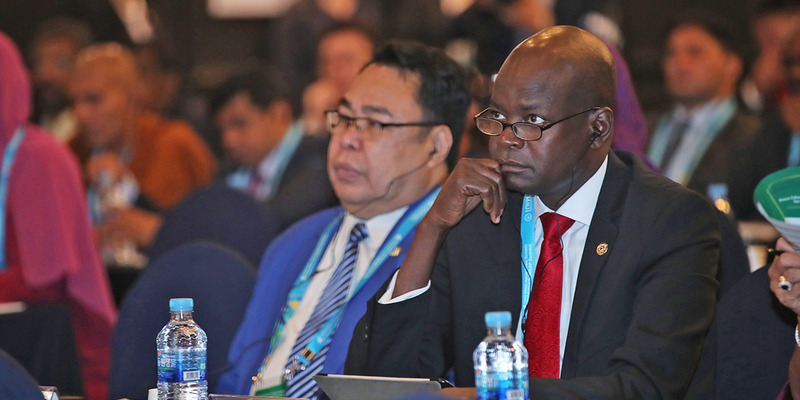 The Peace Education Development Forum for Global Advancement was an important event that demonstrated the feasibility of implementing peace education through close cooperation with Ministries of Education and education professionals in various countries. Moving forward, it is clear that institutional support needed for the continued implementation of peace education should be sought steadily. The state and the government must strive to secure public opinion of, as well as the right to, peace education, and at the same time those in the education field should proactively request job training for the establishment of advisory groups working for the development of peace training materials. This is the phrase that was written on a pen, which had been made from the remains of bullets that had been melted down in celebration of the signing of the Colombian Peace Treaty two years ago. Amid the wounds and suffering created by the civil war that had lasted more than half a century, the people of Colombia expected the nation to be rebuilt peacefully through education. However, this is not only relevant in conflict-zones like Colombia, but rather it is an issue that should be considered by all nations around the world. Learning the values of peace through systematic education allows children to exercise and secure their right to peace on their own through the application of democratic values. At the same time, through the presentation of the risks and consequences of conflicts, they are also given the opportunity to create peaceful solutions to problems. The more children are exposed to and receive this type of education, the sooner the peaceful future that all are working towards will be realized. The way that peace can be passed down as an inheritance to future generations is for the current generation to enjoy their right to peace without any obstacles through peace education. If bullets have recorded human history in the past, then peace education is what will be used to record our future.